An English clergyman by day, Rev. Stephen Hales (1677-1761) believed he had “a duty to discover and wonder at the wisdom and goodness of God by studying His creation.”* Driven by this belief and a deep fascination with health and disease (but no formal medical training), Hales went on to study astronomy, botany, chemistry, and animal physiology. His credits include developing the first artificial ventilator to bring fresh air into confined spaces such as ship holds and prisons. While Hales regarded his ventilation machine as his most important invention, his contributions to plant and animal physiology were equally significant. At a time when the mechanics of respiration and circulation were a mystery, his series of animal experiments led to the first understanding of blood pressure. 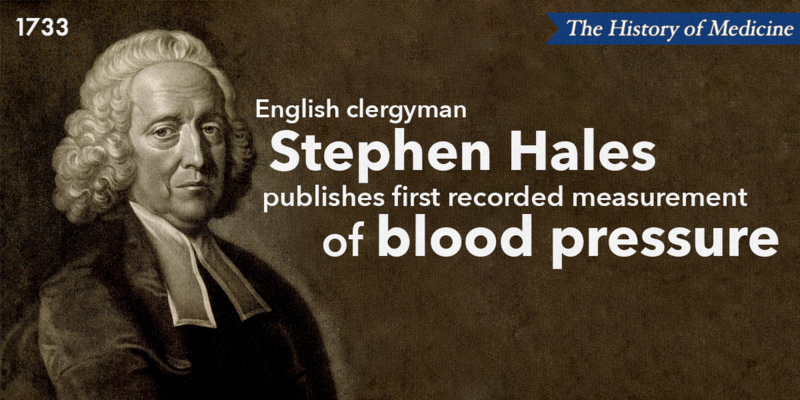 He inserted a tube into a mare’s artery and observed the pulsing of blood into a twelve-foot glass tube, thereby becoming the first person to measure blood pressure. It would be another century before his device (called a manometer) would be improved upon by a French physician, Jean Leonard Marie Poiseuille, (who replaced the long tube with measurement in millimeters of mercury), and later a German physician, Samuel Siegfried Karl Ritter von Basch, who found a way to measure blood pressure without piercing the skin. Hales also discovered that substances could be used to dilate or constrict the blood vessels, and that, contrary to popular belief, blood pressure was not responsible for muscle movement -- paving the way for brand new areas of medical research. Click here to learn more about vascular surgery.